The newest restaurant in Nehru Place offers great food with a fantastic view. Piso 16 is winning for their great food, relaxed vibe and of course, the stellar view. Located right next to Royal China on the 16th floor of Eros Corporate Tower, you get a pretty sweet view while you’re dining. 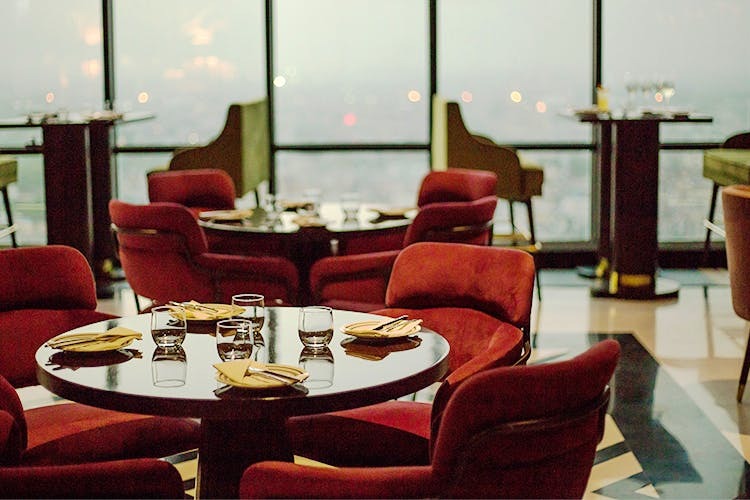 Stick to a table by the window and you get a sprawling view of South Delhi below. The newest fine dining restaurant in town, it’s got a relaxed vibe and we hear it picks up in the evenings. We especially loved their leafy, open outdoor space where you’ll find us having sunny winter brunches. We started our meal with the pulled pork and tropical fruit salad, that came with a fresh serving of chilled mangoes and a light lemon dressing. While it was tough to pull ourselves away from this, we switched to the prawn and calamari which was light, and the buttery garlic sauce they served it in had just the right blend of flavours. The fried chicken marinated in buttermilk may not qualify as fine-dining food, but do not underestimate the power of a well-fried plate of chicken. The cocktails were a little too strong for our liking, but we really enjoyed the Pisco 16 and their white wine sangrias. We did hear the other table raving about their fish – they prepare a fillet of the day a signature white wine sauce. We’ll be honest, we didn’t try anything vegetarian from the menu. Moving on to dessert, we went with The Blondie, a white chocolate brownie served in a rich dark chocolate sauce with berry compote and mint. It’s a great place to go for a birthday brunch or for an anniversary dinner with bae. It’s a little on the expensive side, but it’s worth it.